AgroAtlas - Relatives - Trifolium lupinaster L. - Lupinaceous Clover. Lupinaster pentaphyllus Moench, Lupinaster albus Link, Lupinaster pacificus (Bobrov) Latsch., Lupinaster popovii Roskov, Lupinaster purpurascens DC., Pentaphyllon lupinaster (L.) Pers., Trifolium albens Loudon, Trifolium baicalense Belyaeva & Sipliv., Trifolium ciswolgense Iljin & Trukh., Trifolium ciswolgense Sprygin, Trifolium dimediatum Salisb., Trifolium litwinowii Iljin, Trifolium lupinaster L. var. albiflorum Ser., Trifolium lupinaster L. var. oblongifolia Ser., Trifolium lupinaster L. var. 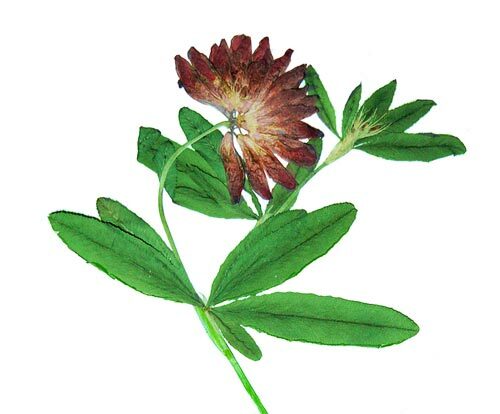 obtusifolium Belli, Trifolium lupinaster L. var. pumilum Popov, Trifolium lupinaster L. var. purpurascens Ledeb., Trifolium lupinastrum St.-Lag., Trifolium pacificum Bobrov, Trifolium popovii (Roskov) Gubanov & Kamelin, Trifolium romanicum D. Brandza, Trifolium spryginii Belyaeva & Sipliv. Perennial herbaceous plant 25-50 cm tall. Root system is a taproot, often branched. Stems 50-60 cm tall, straight, glabrous or weakly pubescent, unbranched or branched. Leaves quinquefoliate, sometimes with 3, 4 or 6 leaflets, mainly glabrous, without pattern; leaf blades 2.0-5.0 cm long and 0.3-1.5 cm wide, lanceolate or linear-oblong. Inflorescences umbel-like heads with flowers 10-15 mm long. Corolla yellowish-white, pale pink, pink to mauve-purple. Fruit is a linear-oblong 3-6-seeded pod. Flowers in June . July, fruits in July . August. Cross-pollinated plant. 2n=32, 48. East Europe, Central Asia (north), Siberia, Far East. In upland, valley and forest meadows, meadow steppes, thinned forests, forest fringes, at riversides, in abandoned fields. Valuable forage plant. Used in hay grazing and field foddergrass cultivation, in double mixtures with grasses or in triple ones with the red clover in lowland meadows and drained bogs. Characterized by high forage qualities. The yield of fresh grass in pastures is 60-120 centners per hectare, after-grass forming higher than in the red clover. Hay yield is 45-60 centners per hectare, depending on the region of planting and soil and climatic conditions, seed yield also varies (0.5-2.5 centners per hectare). Good honey plant. Polozhij AV., Malyshev LI., ed. 1994. Flora of Siberia. V.9. Fabaceae (Leguminosae). (In Russian).